These are clues that you may have hard water. Hard water has a high concentration of calcium and magnesium which, in addition to the symptoms above, can cause scaly deposits in water pipes and inside appliances, your water heater, dishwasher, and washing machine, restricting water flow and reducing service lifespan. Hard water isn’t just annoying. It’s a real problem that can cost you money if left untreated. Softer hair and skin. Soft water rinses off better so you’ll be cleaner. Your clothes will be softer and cleaner too! Easier cleaning. Soap dissolves better and cleans better in soft water. You’ll also need to use less soap. Reduce repair and maintenance costs. No more scale build up on shower heads, faucets, appliances and pipes. Your stuff works better and lasts longer. There’s no need to guess about your water. Simply call Pure Water Solutions for a 100% FREE, no-obligation water analysis. We’ll test your water for mineral content and contaminants. You’ll receive a free written report. Your water analysis is 100% free! Ross installed a whole house filtration and softener system in our house. He installed the system quickly and showed us how to maintain it. He has made himself available since the installation to answer questions. Our well is high in iron and calcium but his system filters it out and provides tasty, clean H2O. We highly recommend his service to everyone in the valley. – Josh B. Pure Water Solutions is proud to be a locally owned Southern Oregon company. We are licensed, bonded, and properly insured. We have years of experience providing both commercial and residential pure water solutions and we bring over 25 years of agricultural, greenhouse, and organic gardening experience to our valued Rogue Valley customers. The next generation in self-sanitizing water conditioning systems — with a patented solid-state control valve — unlike any other system. Fights Iron! Removes both iron and sulfur bacteria! Our Sanitizer water treatment systems combine patented self-chlorinating technology with advanced electronics to perform like four units in one — softening, removing iron and manganese, and raising low pH levels. This self-sanitizing system also controls odors caused by nuisance bacteria and minor sulfur conditions. The Control Valve Advanced — Easy-to-read digital lettering clearly spells out all commands and functions. An audible chirp even alerts you to “low salt” conditions or other service needs. 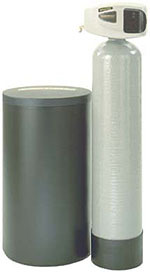 At the heart of our Water Softener Plus’s performance is an exclusive crystalline filtration media. In a single pass, this unique media does more to remove hardness, iron and manganese, while raising low pH levels, than any other media available today. Whether you have hard municipal water or extremely hard well water, Pure Water Solution’s water softeners deliver the clear, soft water you want and need. Its easy-to-read LED screen and user friendly console allows you to monitor all operating functions. It’s true … nothing will last longer than your first impression. Advanced history and diagnostic screens. It’s the Meter… Water usage is electronically monitored and the system automatically regenerated based on actual water consumption. The controller can anticipate higher water usage based on previous trends and regenerate the system in advance, as needed, to ensure the availability of quality water. Likewise, when water usage is low, the system regenerates less often, saving on salt and water.It’s the Electronics … The microprocessor captures all water softener operations, including gallons per day, total gallons, peak flow rates, and total regenerations. Time is also held in memory and protected by a built-in battery backup. It’s the Control Valve… A rugged, Noryl™ control valve handles high flow rates without dropping household water pressures — like when showers, toilets and faucets are all in use at the same time. Optional weather cover for outdoor installations is available on both models. Only Pure Water Solution’s model features a top tank flange for easy servicing. for your free on site water testing results.